Much nicer weather, than the downpours of round 1, greeted 57 riders to the Frodsham Caves venue for round two of the 2 Machs Motorcycles, Oset, Cheshire Cup. Another record entry for the series, fortunately the grassy banks of the land gave some room to spread out. 10 sections were marked out, 5 for Novices and 5 for Inters & Experts, all completed four times each. It was great to see riders families getting involved, observing and generally helping each other in the spirit of the sport. Lewis Hurdsman took the overall Expert class honours on 18 marks, the sections proved harder than expected in some areas and it was good to challenge someone of Lewis’ high level. Morgan Shepherd followed just one mark further back. With Kieran Skehen showing further improvement, as a newcomer to trials last year, against the two national riders ahead of him, dropping 37 marks. The C Class Inters route was won by, Cumbrian, Jack Long having a superb ride to drop just 23 marks on a challenging course with Jack Edwards following on 34, Gethin Beech Jones enjoyed his new Lipo batteries finishing in third place on 37 marks in just his third trial. Archie Hollingsworth has adapted well after upgrading to an Oset 20 to take fourth place. Ellie Molyneux was again in a class of one winning the C class Novices on just 15 marks, the least marks lost by anyone on the Novice route. Will Hughes had obviously gotten out of the right side of bed on sunday morning with a superb ride in the D class Inters, winning on just 27 marks. Alfie Hoyles took another huge step forward riding out of his skin to finish in second place having stepped up to the largest Oset at xmas. Joint on 34 marks, losing out by 10 cleans to Alfie’s 11 was trials newcomer Harvey Davis, surely a rider to watch for the future. Callum Heath is another rider who has stepped up to the Inters route after starting trials late last season. A great ride saw him finish in fourth place. Zane Stout took the honours in the, 25 rider, D class Novice route. Losing most of his marks on the off-camber section 4. Liam Campbell was just one mark further back in second place, adapting well to his new 20 Racing. Jess Widdowson bounced back after a nasty fall in the early stages, taking third place by just one mark from Molly Barber in fourth. 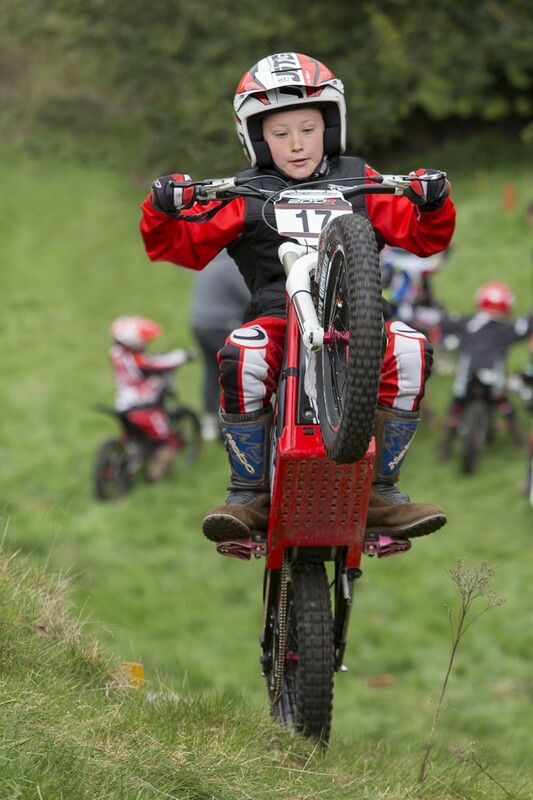 Jobe Griffiths, impressed all with the best wheelie of the day on section three, in the process also took the E class novice win by most cleans from Corey Shepherd. Bailey Holmes and Aaron Makin battled it out for third position, with Bailey taking the honours by just two marks. All in all a successful day, running smoothly thanks to all of the observers volunteering their time so many thanks to them. Once again thanks also to Matt Barber taking his time to help to mark out the sections on Saturday and scrutineering the riders machines on Sunday. Hopefully the sun will shine at round three, coming up in only a couple of weeks time. May 3rd sees the series return to the popular Hales Superbole Downhill Mountain Biking centre, Harthill, Nr Chester. Please click the links below for the full results, updated championship table and Video.